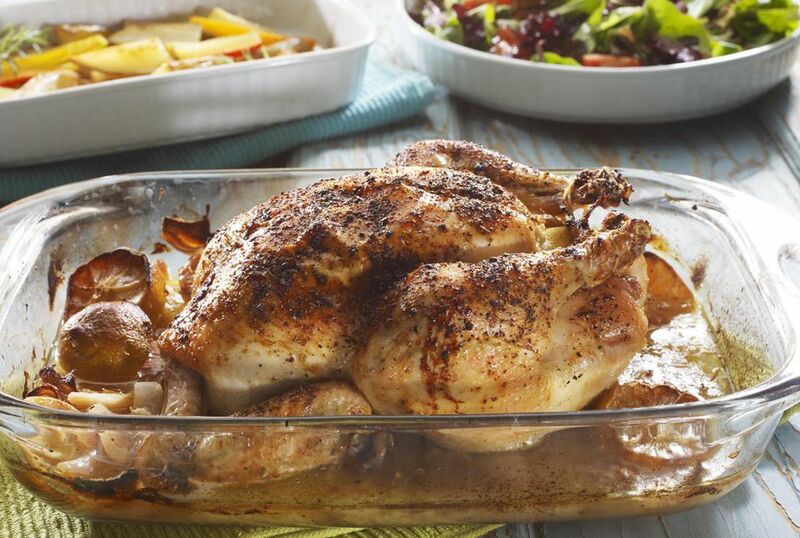 If you love rotisserie chicken, but do not have a rotisserie accessory, you can achieve a similar effect by baking one in your oven. The method begins by seasoning a whole chicken with a good blend of herbs and spices. Marinating overnight helps infuse flavor and tenderize the chicken. Whole chickens can be purchased in most areas for less than $1 per pound, so they make an economical meal. And this recipe is easy as pie so you have a win-win situation. Remove any giblets from the chicken and trim the wing tips. Freeze them for other purposes or discard. Wash the chicken thoroughly, inside and out, in cold water. Pat dry with paper towels. Whisk together brown sugar, paprika, salt, onion powder, garlic powder, thyme, allspice, cayenne or chipotle pepper, and black pepper until combined. Sprinkle this mixture over the exterior of the chicken and salt the cavity. Place seasoned chicken in a resealable bag or wrap in two layers of plastic wrap. Refrigerate 4 to 6 hours or overnight (see Notes). Heat oven to 350 F. Line a roaster pan with foil, shiny-side up. Insert a V-rack in the pan. Place the chicken breast-side up (see Notes) in the V-rack. Pierce the inside of the cavity of the bird in 4 or 5 places to allow the steam to penetrate. Stuff the cavity with the onion quarters. Roast for 2 hours, or until an instant-read thermometer reaches 165 F when inserted into the thickest part of the meat (not touching bone). Let chicken rest for 15 minutes before carving. Discard onions from the cavity. Carve and serve. Notes: If you do not have the time to wait for marination, the chicken will be just fine if you immediately cook it after seasoning. If the presentation is not an issue, consider roasting the chicken breast-side down. This allows all the juices to drip into the breast meat for a moister result.